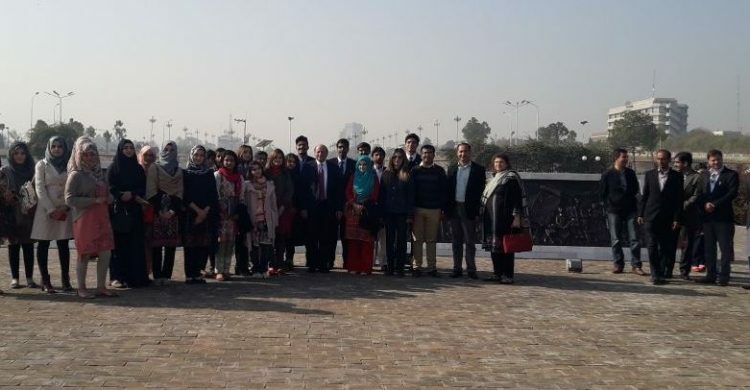 A select number of students from the MPhil and MSc DSS along with faculty members visited the Upper House of the legislature, the Senate of Pakistan. Taken on a guided tour of the House, the group visited the various memorials and tributes created by local artisans and artists to commemorate the struggle of democracy and legislative progress in the country. The student walked through the “Gaali Dastoor,” and were briefed about how the country and its citizens proactively fought for the protection, restoration and safeguard of constitution, and democratic norms. With excellent display of posters, rare archival documents, the overall ambiance and dedicated murals commemorating the activists past and present, was by itself a great education and awareness building exercise. The group was further briefed on the working of the Senate, legislative process, the function and jurisdiction of committees of the senate by Mr Haris Rehman, deputy Secretary, Senate Secretariat. Followed by a Q&A session in which the students asked questions about passage of legislative bills, budget, judicial autonomy and constitution making.